I have, been compiling the records of the men of 'Lowthers Lambs,' and have to date information on over 3600 of them. I am attempting to produce a biography of every soldier who was an original of the Southdown Battalions, my research will be available in DVD format in the near future. I would welcome any information, however trivial it may seem; some of the best research starts with a piece of trivia. 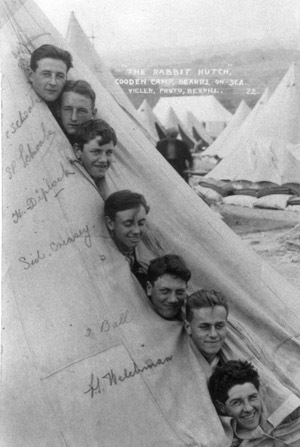 I am interested in purchasing or copying, letters, diaries, postcards, photographs, medals or any memorabilia relating to the 'Southdown Battalions'. 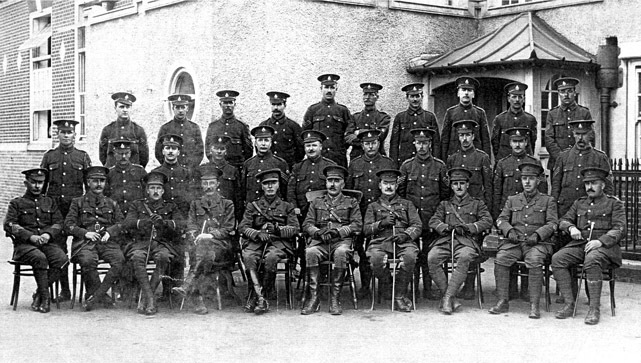 "Officers and NCO's of the 12th Royal Sussex"
Bexhill. May 7th. 1915. Nelson Carter is second from the left.